Ike the Network Guy: Internet... in Outer Space. A DTN story. One technology that has peaked my interest lately is a form of "intergalactic" internet protocol called Disruption Tolerant Networking. I've had a chance to do some research on it and for the life of me I cannot understand why it fascinates me....but it does. Disruption/Delay Tolerant Networking, or DTN for short, is an answer to the shortcomings of using TCP/IP in space. In short, TCP/IP protocols do not function well in the vastness of an interplanetary network. Why? Because TCP/IP works well on a terrestrial based network where the distances are relativity short (if one can imagine a packet from the US to China as being short) and destinations between nodes are typically at a fixed position. Packets travel down a wire (or through the air and eventually down a wire) to their destination. Acknowledgments are are made, connections open, and data transfers. It's this session connection that makes the world go round. So what does this have to do with DTN? Well in outer space destinations are not at a fixed locations. Satellites travel around moons or planets which in turn revolve around the sun. There are plenty of time where these devices cannot be reached due to planetary blackouts. Trying to establish a 3 way handshake when all devices are moving throughout space is very difficult and prone to disruption and delay. Because of the vastness of space, such connections would be impossible to maintain. 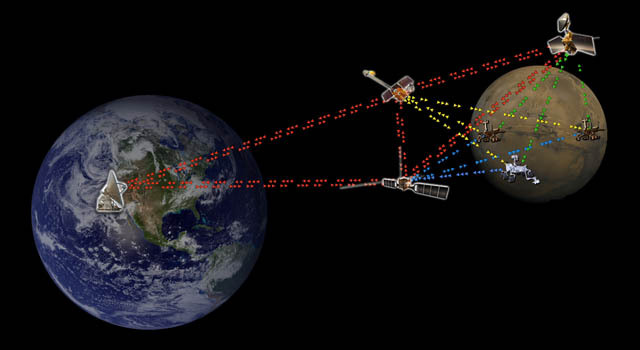 Travel time alone to mars would require that satellites be aligned at a specific moment to communicate. This is just not practical when dealing with the distances we have to work with in space. That's where DTN routing protocols operate at a "store and forward method. Meaning meaning data can be sent to an interplanetary satellite. That satellite would send a confirmation back to it's source notifying of message received Then it would store the data until it could transmit the data to the next "hop". When the next hop received the data, it too would send confirmation back to its sender and it would store and forward the data on when the next available hop along the path to it's destination was available. This process would continue until the data eventually reached it's destination. This method of delivery is extremely fault tolerant to the extreme time that transmission takes in outer space, and the ever changing position of these transmission satellites. I won't (and probably couldn't) get into all of the details that DTN has to offer, but that is a brief summary of how it works and why it works better in outer space? Does this mean we will be buying gifts from amazon from Mars anytime soon? Probably not, but it does open up a lot more possibilities about data transfer in space. The internet doesn't have to stay on planet Earth. It can stretch as far as we are able to go, and with the use of Disruption/Delay Tolerant Networking we may be able to take it farther than that.